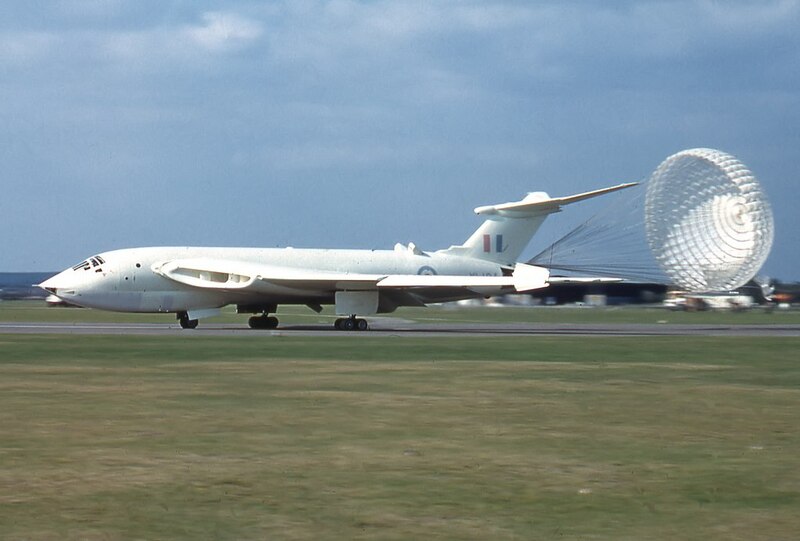 The Victor experienced maximums of about minus 3 and plus 5 G’s (more than airframe design limits), and the whole incident lasted about 60 secs with the descent from 46,000 to 16,000 in about 20 secs – vertically supersonic! The following story was written by John Saxon and appears on his website. John Saxon was a test engineer for Elliott Automation that provided the inertial navigation system for Blue Steel missile. He wrote two books on Blue Steel project. This was going to be another Blue Steel “carry over” trial to test missile systems – they had almost become routine. But flying in V-bombers always got the adrenalin flowing just a little. I was a civilian working with Elliott Brothers – an English firm now part of GEC I believe. We were concluding the first development phase of one of the world’s first Inertial navigation systems which was used to guide the Blue Steel stand-off bomb. Our Handley Page Victor B.2 aircraft was parked in the loading bay on Edinburgh air field near Adelaide South Australia. The 6 ton 36ft long missile was secured under the bomb bay – fully fuelled with Kerosene and High Test Peroxide – a rather nasty mixture, and so the loading bay was fairly well flooded with water – just in case. We walked out to the aircraft in a group and climbed on board – John Baker the Pilot, and chief test pilot for AVROs. Flt Lt Jimmy Catlin was in the right hand seat. Flt Lt Charlie Gilbert in the rear Radar Navigator position – myself in the centre rear looking after the Navigator systems. Flt Lt “Glen” Glendinning in the right hand rear Air electronics officer’s seat looking after the missile autopilot and other aircraft systems. Finally sitting in the 6th “jump” seat was Frank Longhurst – another civilian working for AVROs who was there to see that Glen was doing the right things with “their” missile. At that point in the trials the civilian crews were beginning the gradual training and hand over to RAF crews who were to complete the trials. We plugged in Intercoms, oxygen, suit cooling air, and begun the seemingly endless pre-flight checks. Eventually everyone was satisfied and we taxied and took off – turning to the SW to climb to our first navigational fix point over Kangaroo Island. 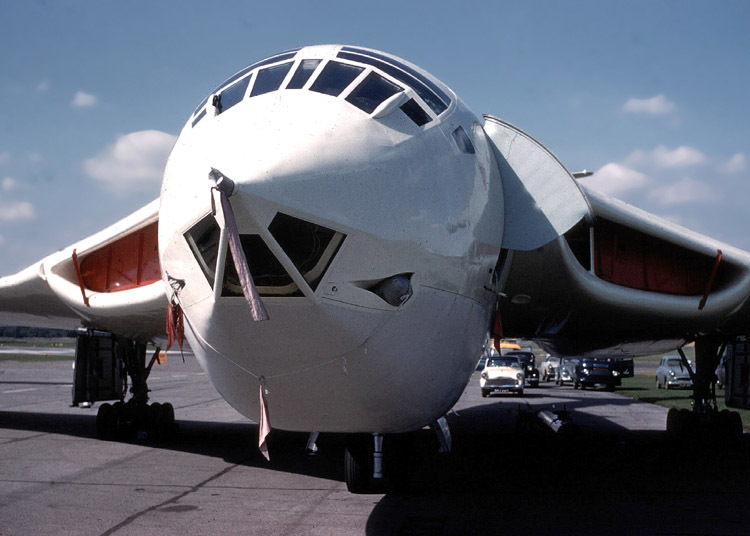 Now despite being an aircraft weighing around 80 tons, the Victor was no slouch in the climbing stakes. I have been from sea level to 50,000ft in around 8 minutes but it was probably a lot slower rate with the Blue Steel missile loaded. Nevertheless the 10,000 ft climb points were passing rapidly until we got to around 46,000 ft I believe and then all heck broke loose. Lots of rapid discussion and attempts to pull up from the front deck, the start of a real roller coaster ride (pitch ups, pull overs, etc.) with engine noise doing wonderful things. Then what seemed (from the back) to be a wingover followed by increasingly violent positive and negative G forces. John Baker activated the “Abandon Aircraft” signs which also dumped cabin pressure, and Frank (who was nominally first out of the rear door) unstrapped and hit the roof quite violently and took no further escape action. In the nominal escape plan I was next to get out, and I managed to half stand and hang onto the camera bracket in front of the nav equipment. But I could get no further towards the side door as we were rotating fast and in what seemed to be a very steep dive. Then after what seemed like a long time (actually about 20 seconds), there was a loud bang from the rear of the aircraft and the rotation changed to a near vertical dive and rapid pull out, accompanied by much creaking and groaning and dust , pencils, pads, etc. flying in all directions. But we were back in semi level flight at around 16,000 ft! Here is what I believe happened. Others who know better than I can correct me if I’m wrong. When we got to 45,000 ft or so the right hand air speed indicating system had a failure causing it to indicate around Mach 1.03. This sent a “transonic” flight signal to the auto stabilisers which initiated a pitch up manoeuvre as the Victors were not designed to go supersonic. The pilots however compared right and left side air speed indications and as the pitch up had started were inclined to believe the faulty right hand system. So they too tried to further reduce speed and ended up in a violent pitch up to an almost inverted position followed by a rapid spin which was impossible to control. Very luckily for us, John Baker had done many test flights in prototype aircraft, where it had become routine to fit breaking parachutes to lift the tail of the aircraft into a more stable dive position, which could be recovered relatively easily. Now this had never been attempted in an 80 ton crescent wing Victor – but nothing much else was working. So John pulled the tail chute which lasted a few seconds before breaking away, but long enough to do the job and allow some heavy stick pulling to level out before doing a submarine imitation. So how does one feel at a time like that? Not too great, but certainly I felt reasonably calm and I remember I had time to think about flight insurance and dependants! As usual when the adrenalin is pumping, everything seemed to go into slow motion. But it was really nice to get roughly straight and level again. It was good that we had all the records from the inertial navigator recorders and were able to analyse them later. The aircraft experienced maximums of about minus 3 and plus 5 G’s (more than airframe design limits), and the whole incident lasted about 60 secs with the descent from 46,000 to 16,000 in about 20 secs – vertically supersonic! Several things happened before we finally got to land. First there was a concern about the correct airspeed as the two systems were still reading differently. Then possible structural damage. Luckily the radio was still working so a chase plane was requested. It was decided to jettison the missile as it was full of highly explosive fuel (whose temperature was rising) and even had some TNT on board for range safety break up if it strayed outside the Woomera range limits. Also because there was no tail parachute, if there had been undercarriage or brake problems, a wheels up landing with a fully fuelled Blue Steel underneath would have been very spectacular! We started missile jettison procedures aiming for a Military bombing range near Port Wakefield, several of the crew had “confirm” switches for jettison, and at the last minute the pilots called stop, and then a go (I think I was the last to select my switch) and away it went. It turns out that the “stop” calls were due to the pilots spotting a school below. There were two guards on the range where we jettisoned and they had been told to keep a look out for a bomb drop. No one thought to mention that it was 36 feet long, weighed 6 plus tons and was full of explosive mixtures, so they walked out onto the sand to take a look. Apparently they “heard it gurgling” on the way down and took off to find their hard hats when it got rapidly larger. But it crashed relatively harmlessly and burnt with only minor explosions between the high and low water marks. But they certainly got a shock! Then the first chase plane arrived. Flt Ltd Alec Hollingsworth RAF scrambled an old Meteor out of Edinburgh – it was great to see him! He flew tight formation passing on airspeed readings and confirming no apparent physical damage. There was no way we could dump the full fuel load so we had to keep flying for at least another 90 mins or so to burn off fuel to get to an acceptable landing weight. Due to the time remaining the Meteor chase plane was replaced by a Canberra flown by Wing Cdr. David Glenn which escorted us for the remainder of the flight. In the meantime we had a nervous 70 minutes or so before the landing. During that 70 minutes Charlie Gilbert introduced me to chain cigarette smoking, I think we got through at least a pack between us in the back. Took me more than 10 more years to kick the habit! Thanks Charlie! So eventually with much foaming of runways, emergency vehicles everywhere and at least one chase plane, we made a good touch down back at Edinburgh. A couple of aftermath items. We had a couple or more drinks in the mess at the airfield with lots of toasts to our safe return. The story goes that co-pilot Jimmy Catlin was well away by the time he had to go to a church social that evening. Apparently he strode across the dance floor to tell the vicar in a loud voice that “I saw your boss today”, before collapsing gently at the vicar’s feet. I wasn’t there but the story has been confirmed by others! A few days later the crew (plus significant others) had a celebratory dinner at a local hostelry, where this picture was taken. Despite the large excursions outside it’s design limits, the aircraft turned out to be in pretty good shape and after some minor repairs went on to launch more Blue Steels for the trials – at the Woomera range of course! Later XL161 returned to U.K., and after a refit at the Handley Page plant, went on to RAF squadron reconnaissance duties. Needless to say – news of the incident leaked out to the press, and after news of the jettison near Port Wakefield got out – there were a few pointed questions in Parliament about large explosive devices being flown around populated areas. Much more fuss would be raised these days, but in the cold war atmosphere of the times, questions soon died away. All in all, it was an exciting few hours! You can download both of John Saxon’s books in PDF format. The 1999 one by clicking here and the 2001 here.